“The Daily” from The Breaks Coffee Company Wins Best Coffee of 2018. “Zip Zinger” from Dune Coffee Roasters Wins Best Espresso of 2018. “Peaberry Kona” from Hawaiian Queen and “India AA” from Alamance Kaffee Werks join them in a tie for Best Overall Coffee. It was a tremendous year for coffee! We sampled some of the absolute best there is. It was a banner year with 15 coffees rating above 90pts. and in the end we had a four way tie for best overall coffee. 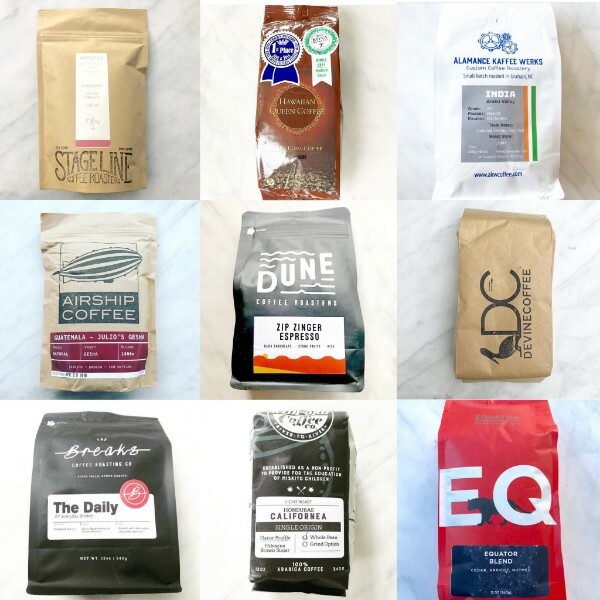 The best coffee of 2018 was “The Daily from The Breaks Coffee Co. in South Dakota. It’s a blend of three coffees, from Central America, South America and Africa. The roast finds the perfect balance between dark and light, to provide an easy drinking coffee. The blend of beans work well to compliment each other. There is a lot of chocolate, nuts, brown sugar, with a small hint of orange. This coffee has mass appeal, and we don’t think you could go wrong sharing this coffee with anyone. “The Daily” – The Breaks Coffee Co. – 93pts. “Ethiopia Guji Natural Kercha”- Cedar Spokes – 92pts. “Peaberry Kona” from Hawaiian Queen Coffee – 91pts. “Julio’s Gesha” – Airship Coffee – 91pts. “India AA” – Alamance Kaffee Werks – 90pts. “Equator Blend” from Equator Coffee and Teas. – 90pts. “Excelso Gran Galope Narino” from Devine Coffee – 90pts. “Mistletoe Blend” from Stageline Coffee Roasters – 90pts. “Peru Norte” from Cedar Spokes – 89pts. “Banko Gotti” from Black Acres Coffee – 89pts. “Honduras Californea” from Radford Coffee Co. – 89pts. The Best Espresso of 2018 was Zip Zinger Espresso Blend from Dune Roasters in Santa Barbara CA. The blend as an espresso was sweet, and gave firm notes of Stone fruit and lemon. It is a versatile and exciting blend of coffees from Colombia, Ethiopia and Brazil. “Mexico Chiapas” from Alamance Kaffee Werks – 90pts. “Colombia El Rosal” form Boil Line Coffee – 90pts. “India AA” from Alamance Kaffee Werks – 90pts. “Brazil Fazenda Bela” from Vibe Coffee Co. – 90pts. “Excelso Gran Galope Narino” from Devine Coffee – 89pts. “Peaberry Kona” from Hawaiian Queen Coffee – 89pts. Peaberry Kona from Hawaiian Queen and “India AA” from Alamance Kaffee Werks complete a four way tie for best overall coffee of 2018. “Zip Zinger Espresso Blend” from Dune Roasters – 180pts. “Peaberry Kona” from Hawaiian Queen Coffee – 180pts. “India AA” from Alamance Kaffee Werks – 180pts. “The Daily” from the Breaks Coffee Roasting Co. – 180pts. “Excelso Gran Galope Narino” from Devine Coffee – 179pts. “Julio’s Gesha” from Airship Coffee – 178pts. “Banko Gotti” from Black Acres Coffee – 178pts. “Mistletoe Blend” from Stageline Coffee Roasters – 178pts. We started Ispirare to share “inspirational coffees”, with the world, that’s why we conduct the reviews and promote specialty coffee. We rate the best coffee, the best espresso, and the all-around best coffee, (the score of the coffee + espresso review). We’d like to thank everyone who shared coffee with us in 2018. We’ll be conducing weekly reviews in 2019 – If you would like us to consider your coffee or have a suggestion for a coffee we should try, please let us know. Finally if you have a love for coffee and finding new roasters here’s the list of 2017 winners. Visit the website’s review section for the complete list of our reviews, and follow us on Instagram for new reviews.